1.You should rinse the coffee maker step by step according to page 3 of instruction. 2. Some parts of appliance is hot when operated, so do not touch with hand directly. 3. Never leave the empty carafe on the keeping warm plate otherwise the carafe is liable to crack. 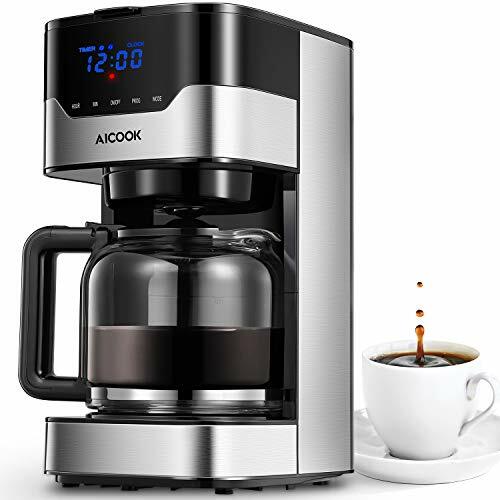 Programmable Coffee Maker: You can enjoy the perfect cup of coffee every morning automatically with the help of programmable timer clock. Brew-Strength Control: The 10 cup coffee machine has aroma control button, allows you to adjust the strength of the coffee to your own taste. 10 Cup Coffee Maker: Enjoy the perfect cup of coffee, no matter how much coffee you brew. With 51.24oz water reservoir, you only need to add fresh water every 10 cup. Anti-drip system: This coffee brewer is with anti-drip system, allows you pause and pour mid-brew with virtually no mess.